Launch of the new Wheelyboat at Llyn Brenig this sfternoon. Ned Thomas takes Terry Evans and his daughter Dona out on the wheelyboat. 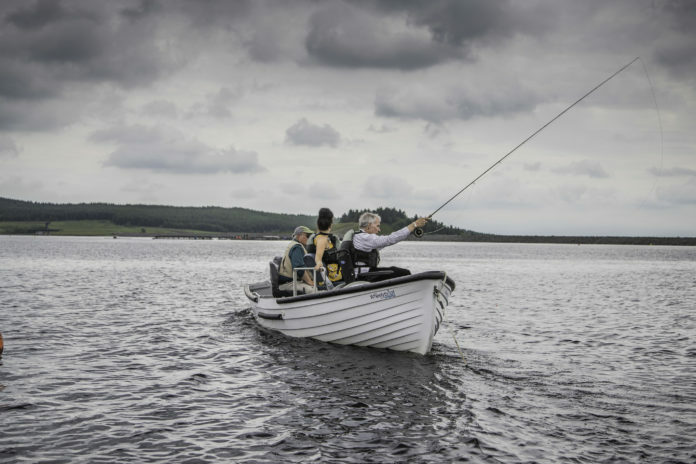 The Wheelyboat Trust and Angling Trust have partnered together to part-fund seven new Coulam 16 Wheelyboats that will enable clubs and fisheries across the UK to provide disabled anglers, and wheelchair users in particular, with access to their waters and the fishing. The project will be divided into two parts, with the first round in spring 2019 providing four Wheelyboats, and the final round in autumn 2019 the other three Wheelyboats. Purpose-built angling boats, both the Coulam 15 and 16 are already widely used on fisheries all over the UK. The Coulam 16 Wheelyboat is identical to the standard Coulam 16, but is built with a hydraulic platform amidships that lowers the angler from gunwale height to floor level. The angler wheels up a short ramp onto the platform and a lever is pressed that lowers the platform. At floor level the angler can then position himself at the bow or stern. 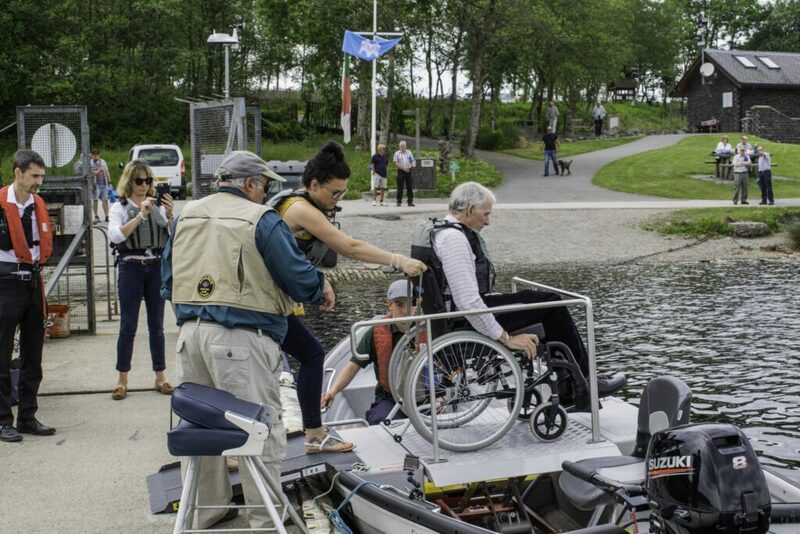 The Coulam 16 Wheelyboat can be driven from a wheelchair and, once on board, the disabled angler can operate the Wheelyboat entirely independently. Launch of the new Wheelyboat at Llyn Brenig this sfternoon. The Coulam 16 Wheelyboat is best boarded from a floating pontoon or jetty, but boarding from the bank is possible with a longer ramp. It has a maximum capacity of three people and the maximum outboard motor is 10hp. It is designed for angling on stillwaters on the drift or at anchor. Its wide beam makes it unsuitable for rowing very far, but it can be used on a river if motored to the swim or pool and anchored up. For salmon fishing, where a boatman rows and the angler fishes from the stern, then a Coulam 15 Wheelyboat is recommended. Two of these accessible boats operate on the River Tweed and applications can be made for this model instead of the Coulam 16 Wheelyboat. The Wheelyboat Trust has raised £35,000 in grants from the Peter Harrison Foundation (£30,000) and Lord Barnby’s Foundation (£5,000) to support this initiative. It is with huge thanks to them both that the seven Coulam Wheelyboats will each be discounted by £5,000 bringing the cost of each boat down to the same price as the standard, non-accessible, version of the Coulam 16. The application process is now open at https://grants.anglingtrust.net/ where detailed information about the project and what is funded is also available. The closing date for applications is Saturday 30 April.